"Go home, and bring your husband, and come here." HILE JESUS WAS teaching in Jerusalem and in the country places near it, John the Baptist was still preaching and baptizing. But already the people were leaving John and going to hear Jesus. Some of the followers of John the Baptist were not pleased as they saw that fewer people came to their master, and that the crowds were seeking Jesus. But John said to them: "I told you that I am not the Christ, but that I am sent before him. Jesus is the Christ, the king. He must grow greater, while I must grow less; and I am glad that it is so." Soon after this, Herod Antipas, the king of the province or land of Galilee, put John in prison. Herod had taken for his wife a woman named Herodias, who had left her husband to live with Herod, which was very wicked. John sent word to Herod, that it was not right for him to have this woman as his wife. These words of John made Herodias very angry. She hated John, and tried to kill him. Herod himself did not hate John so greatly, for he knew that John had spoken the truth. But he was weak, and yielded to his wife Herodias. To please her, he sent John the Baptist to a lonely prison among the mountains east of the Dead Sea; for the land in that region, as well as Galilee, was under Herod's rule. There in prison Herod hoped to keep John safe from the hate of his wife Herodias. Soon after John the Baptist was thrown into prison, Jesus left the country near Jerusalem with his disciples, and went toward Galilee, the province in the north. Between Judea in the south and Galilee in the north, lay the land of Samaria, where the Samaritans lived, who hated the Jews. They worshipped the Lord as the Jews worshipped him, but they had their own Temple and their own priests. And they had their own Bible, which was only the five books of Moses; for they would not read the other books of the old Testament. The Jews and the Samaritans would scarcely ever speak to each other, so great was the hate between them. When Jews went from Galilee to Jerusalem, or from Jerusalem to Galilee, they would not pass through Samaria, but went down the mountains to the river Jordan, and walked beside the river, in order to go around Samaria. But Jesus, when he would go from Jerusalem to Galilee, walked over the mountains straight through Samaria. One morning while he was on his journey, he stopped to rest beside an old well at the foot of Mount Gerizim, not far from the city of Shechem, but nearer to a little village that was called Sychar. This well had been dug by Jacob, the great father or ancestor of the Israelites, many hundreds of years before. It was an old well then in the days of Jesus; and it is much older now; for the same well may be seen in that place still. Even now travelers may have a drink from Jacob's well. It was early in the morning, about sunrise, when Jesus was sitting by Jacob's well. He was very tired, for he had walked a long journey; he was hungry, and his disciples had gone to the village near at hand to buy food. He was thirsty, too; and as he looked into the well he could see the water a hundred feet below, but he had no rope with which to let down a cup or a jar to draw up some water to drink. Just at this moment a Samaritan woman came to the well, with her water-jar upon her head, and her rope in her hand. Jesus looked at her, and in one glance read her soul, and saw all her life. "Please to give me a drink?" "How is it that you, who are a Jew, ask drink of me, a Samaritan woman?" "If you knew what God's free gift is, and if you knew who it is that says to you, 'Give me a drink,' you would ask him to give you living water, and he would give it to you." There was something in the words and the looks of Jesus which made the woman feel that he was not a common man. She said to him: "Sir, you have nothing to draw water with, and the well is deep. Where can you get that living water? Are you greater than our father Jacob, who drank from this well, and who gave it to us?" "Whoever drinks of this water," said Jesus, "shall thirst again, but whoever drinks of the water that I shall give him, shall never thirst; but the water that I shall give him shall be in him a well of water springing up unto everlasting life." "Sir," said the woman, "give me some of this water of yours, so that I will not thirst any more, nor come all the way to this well." Jesus looked at the woman, and said to her, "Go home, and bring your husband, and come here." "I have no husband," answered the woman. "Yes," said Jesus, "you have spoken the truth. You have no husband. But you have had five husbands, and the man whom you now have is not your husband." "Sir, I see that you are a prophet of God. Tell me whether our people or the Jews are right. Our fathers have worshipped on this mountain. The Jews say that Jerusalem is the place where men should go to worship. Now, which of these is the right place?" "Woman, believe me," said Jesus, "there is coming a time when men shall worship God in other places besides on this mountain and in Jerusalem. The time is near; it has even now come, when the true worshippers everywhere shall pray to God in spirit and in truth; for God himself is a Spirit." The woman said: "I know that the Anointed one is coming, the Christ. When he comes, he will teach us all things." "I that speak to you now am he, the Christ!" Just at this time the disciples of Jesus came back from the village. 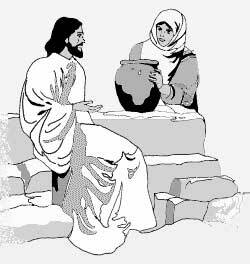 They wondered to see Jesus talking with this Samaritan woman, but they said nothing. "Come, see a man who told me everything that I have done in all my life! Is not this man the Christ whom we are looking for?" "We have heard for ourselves; now we know that this is indeed the Saviour of the world."